Serving as a designer, instructor, consultant and adjudicator, Todd Clevenger has been involved in the pageantry arts for more than thirty years. DCI, WGI, BOA and circuits across the country have seen finalist performances from groups with which Todd has worked. Well-versed in all facets of the activity, Todd is currently active in marching band, drum corps, winter guard, indoor percussion, and indoor winds. Clevenger Design is on Twitter, Facebook, and LinkedIn. Want your own business page or blog or archive? Contact us. Email: amosmagdotcom@gmail.com. Or just use the Contact form at the bottom of this page. Want a business page on Amos for your very own? Contact us. Form at the bottom of page. Five stars. Double-thumbs-up. There is nothing wrong with Knotty Pine on the Bayou. It’s located in Cold Spring, Kentucky and it’s off the beaten path. To be honest, it’s a little out of the way but the view is worth it. It’s sort of on the edge of a valley with a river at the bottom and there’s a beautiful view from the restaurant and from the car on the way there. This place is welcoming and homey. It has real live Cajun flavor. I heard about it from a local and regulars were there pulling on beers at the bar. I’m not local but I can tell you there is nothing I would have changed about Knotty Pine on the Bayou. You absolutely feel like you’re in New Orleans when you’re there and the service is five stars. The food is fabulous. I enjoyed the alligator bites —taste like chicken — as an appetizer ($13.95, served with creole sauce). I then plowed through a side salad ($4.95) accompanied with a generous supply of bleu cheese. The coup de grace was probably the gumbo: the gumbo (cup $5.95, small bowl $8.95) was straight-from down-home and tasted like it came straight from the French Quarter. It was 100 percent down-home NOLA. I finished it off with a mouthwatering and perfectly-cooked steak, blackened just like Bourbon Street does it accompanied with country green beans. I did not have room for dessert. I’m wanting to go there again; this place is worth being a destination restaurant if you’re within a couple hours drive. Besides the steak, they offer etouffee, red beans and rice, surf and turf, oysters bienville, frog legs, and crawfish boils. My wife has googled the menu (she does that) and swears she’s going there just for the appetizer of spinach and artichoke rangoons served with chili sauce ($9.95). Knotty Pine is great: it alone is a really good reason to visit the god-forsaken state of Kentucky. Even the chance of running into a UK fan couldn’t take the luster off this gem. Get your own business or personal page on Amos. Just let us know. Send us content. You can find us on Twitter, Instagram, and Microblog. You can even fill out a ‘Contact’ form at the bottom of this page, our About, or our Contributor Page. Easy to do; big returns. What are you waiting for? I have to be honest. This is always one of the hardest days of the year. The months of preparation are over and all I can do is sit back and watch what happens. I’m not a parent but I always imagine this is what sending your child off to school for the first time feels like. You spend so much time planning and teaching and nurturing and advising and living and dying on every moment and then all of a sudden you no longer have control and they are off on their own. All I can think of right now is: have I done the right things? Have I made the correct choices? Will they be ok? Will all of the blood, sweat, tears, frustration and hard work be enough to allow them to reach for their dreams and feel like it is all worth it? I never know. I can’t get those thoughts out of my head. I just want them to show the world how incredibly special they are. Every time this happens I feel like a little part of me walks out into the big harsh world and I obsess about my role in its preparation. I love it and I hate it equally. I am always proud of the intense effort and love that is behind all of it but I have to admit that a small part of me dies on the last count of every last run-through. It goes from what could be to what IS. I can never really wrap my head and heart around that fact. At the end of the day, I understand that I love the process infinitely more than I love the product. It is what, who and why I am. I can only look forward to the the next beginning and the next opportunity to touch lives, inspire dreams and produce magic. No matter the result, I always feel incredibly blessed. Want a business page on Amos for your very own? Contact us with the form at the bottom of the page. Here’s what happens when you get off the plane at the Springfield, Missouri airport at 7:30 on a Friday night. First, you don’t get to eat or drink because nothing is open (at 7:30 on a Friday night, mind you). Second: the airport is apparently owned by /sponsored by/or the birthplace of Bass Pro Shops. There are metal fish hanging from the ceiling. The middle part of the carpeting is blue; the edges brown: so you’re swimming/walking upstream or down, whatever, but you’re very definitely supposed to be in the middle of Nature. And you’ll have to either hunt or fish your own dinner because nothing at the airport is open. At 7:30 on a freaking Friday, not that I’m bitter. At 7:30 on a Friday night, actually, when our plane pulled up at the gate, there were zero other planes. Which is weird, quite frankly. I suppose I shouldn’t have been surprised the restaurants were closed. In fairness, by “restaurants,” I am referring here to one MacAllister’s and a coffee stand. But they were both closed. It’s not like Friday’s a school night, you know what I’m saying here? It’s kind of funny because I’ve been working on an airport article to publish. (Clevenger Design aims to please, after all.) And, this weekend, I got to visit the First Baptist Bar and Grill, Airport, Bait and Tackle Shop in Springfield, Missouri. I didn’t get to eat or drink anything when I was there, but I was there. In the fake river. With the metal fish. And it’s actually a pretty convenient airport (minus the food thing) with polite people working (but they’re not working at MacAllister’s). Also, there’s a full size Bass boat just sitting in the terminal. I’ll get to see it again in four weeks. I’m thinking of packing a lunch bag. I might even sit in that boat. I’ve been hunting around lately for a new backpack. I don’t want to. I love the backpack I have. I’m kind of surprised I haven’t actually ever named it. Sure, I call it my field bag, but it’s my year-round companion. It’s My Bag. Rehearsals, meetings, contest days, wins and losses and teachable moments— this old Swiss Gear bag pretty much keeps the same batch of necessities in it always and, for twelve years, it’s been with me everywhere. Band and guard people can get pretty attached to their bags. After all, we live out of them most of the year. I’m no exception. And, to be honest here, if I could just magic this old trusty bag back to its original, not-falling-apart condition, well, I’d do it. But things are what they are and this bag won’t make it through another summer, so I’ve been shopping for a replacement (this Swiss Gear is a similar option; Or this one.). It’s rough. I like my old faithful bag. It’s served as a footrest, yard marker, pillow, and as a gathering point for countless bands, drum corps, and winter guards. It’s traveled with me to 49 of the 50 states, including multiple trips across the Pacific to Hawaii. We’ve even been to Paris together (not to mention the UK, Belgium, non-Paris France, and Holland). That should be forever, right? Just for fun, I googled what kids carry in their contest and rehearsal bags. (It got me out of shopping for my replacement backpack, after all.) The kids carry a lot of the same things the adults do; the girls tend to have WAY more makeup; the boys could remember extra socks, if you ask me. And it’s kind of weird (and creative and wonderful) that these kids are taking the time to make YouTube videos regarding what they should and should not put in their backpacks for show and rehearsal days. You gotta love the kids. So, I told you what’s in my bag. And once I make the impossible decision on the next bag, I’ll keep you posted. In the meantime, what are your pageantry essentials? It’s the life of a designer. You think you’ve got the perfect moment locked down— and then you notice the trash can in the view. The virtues of a being a pageantry gypsy include seeing lots of things. This? 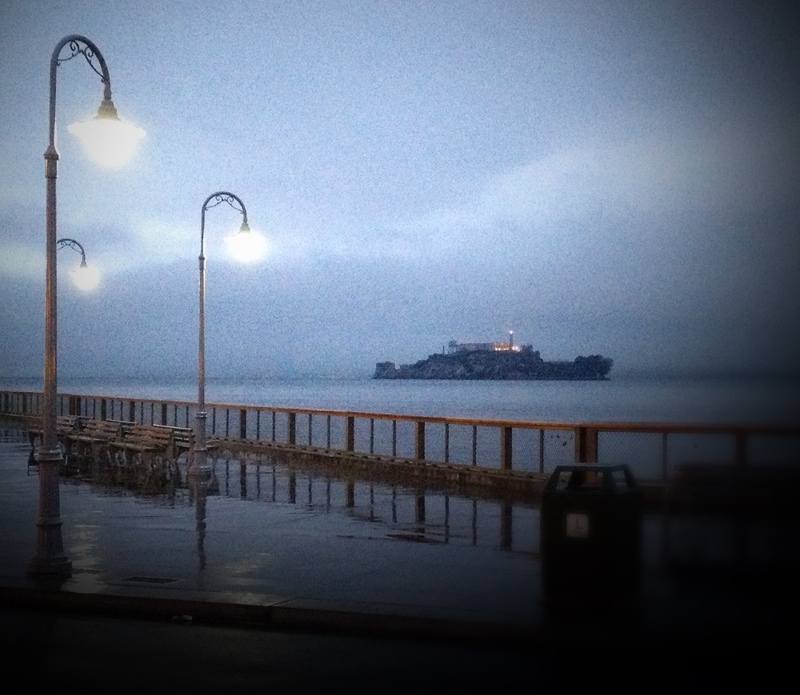 Seen while standing on Fisherman’s Wharf in the mist of the Pacific while looking straight at the lights of Alcatraz. Turns out there’s Pacers Jail. I went there. Click to find out more.